Hotel 81 Palace is found in a vibrant corner of Singapore, a short 10-minute walk from Aljunied MRT Station. Surrounded by well-known eateries, the cosy hotel offers value-for-money accommodation. 81 Palace is located in the colourful Geylang District, famous for its local eateries and nightlife options. The hotel is a 30-minute drive from Changi International Airport and a 15-minute drive from the popular Orchard Road. 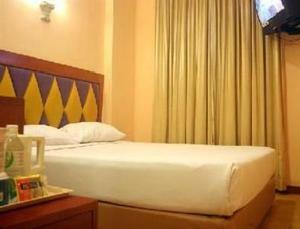 Guestrooms at Palace are fitted with ironing facilities and a tea/coffee maker. Each room comes with a private bathroom with hot shower. Hotel 81 Palace offers laundry services. There is a tour desk to assist guests with city tour booking arrangements. Rooms: Hotel Rooms: 192, Hotel Chain: Hotel 81.